Medieval Gaunlets of steel and leather construction for full wearability, featuring fully articulated fingers and wrists, and a knuckle protrusion at base of thumb for additional protection. 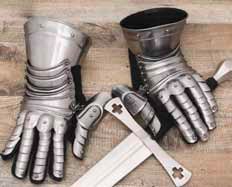 Historically, gauntlets were used by soldiers and knights. It was considered an important piece of armour, since the hands and arms were particularly vulnerable in hand-to-hand combat. With the rise of easily reloadable and effective firearms, hand-to-hand combat fell into decline along with personal armour, including gauntlets. This page was last modified on 2 May 2014, at 18:58.